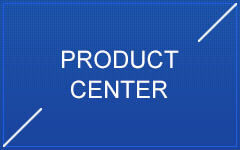 Chengdu Chauncey Automation Machinery Co., Ltd. 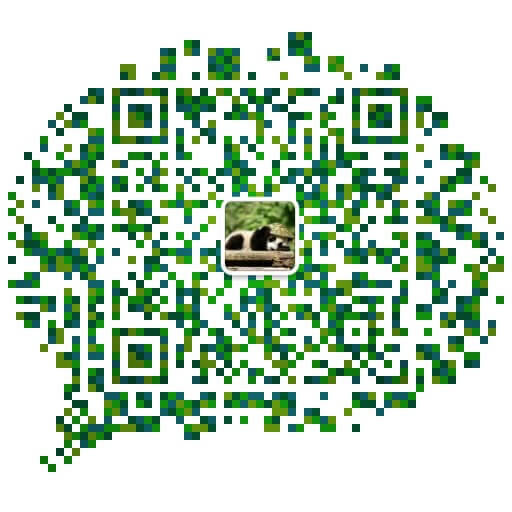 Address: Yin Jia Village Industrial Park, Jiangyan District, Taizhou, Jiangsu. Congratulations on the success of the research and development of the automatic blending equipment for the mixer. 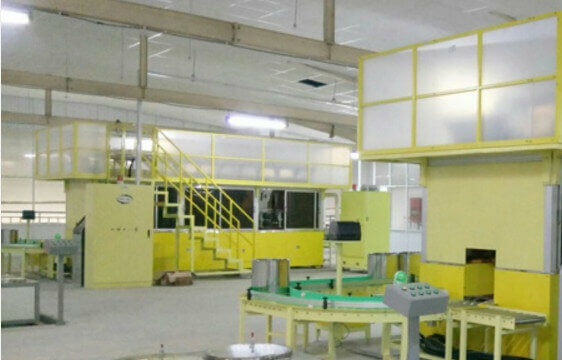 Automatic metering system of micro formula and automatic ingredient system of small material are developed by our company for rubber, feed, food, pharmaceutical, chemical and other industries with high production efficiency, high precision, automatic ingredient auxiliary system. The system has the function of automatically weighing and distributing powder (carbon black, etc. ), granular (paraffin, etc.) and oil materials according to the required production formula. It can be adapted to 75-150L mixer, mixer, extruder with different specifications. 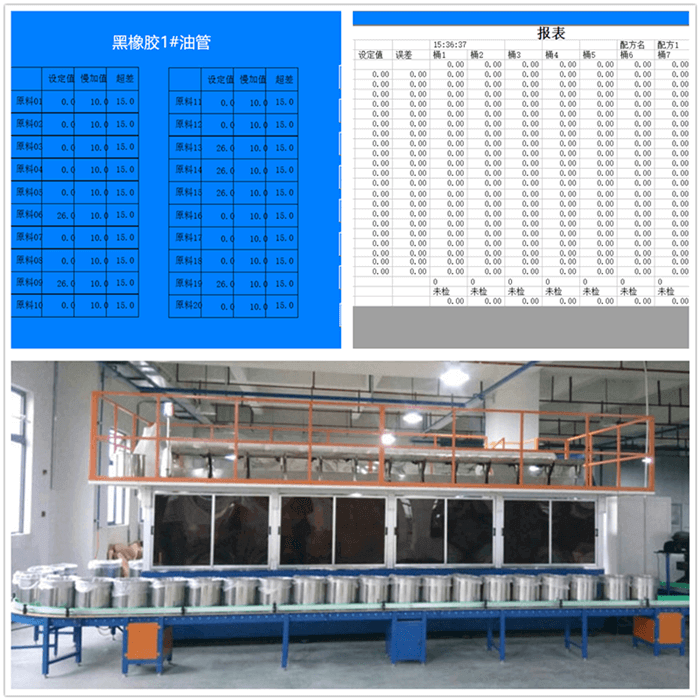 It is mainly suitable for large and small material formula production, intelligently storing production formula and calling production matching at any time. Party, storage production data, etc., contribute to product quality traceability. 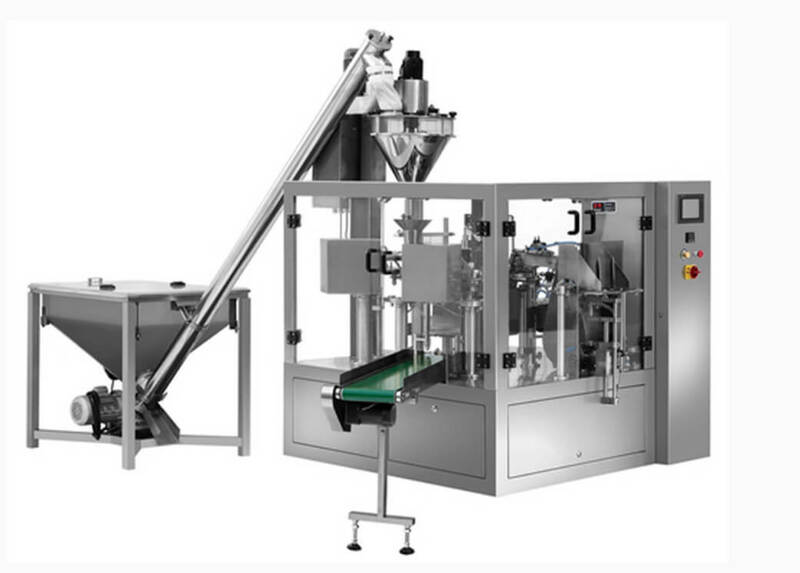 Auxiliary ingredients automatic dispenser, excipients automatically according to ingredients, equipment, accessories automatic weighing system, additive automatic weighing machine. We have increased the relevant columns, rich content, make up for the lack of the previous, but also further improve the website management mechanism. 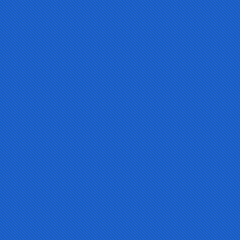 We will fully gather from all aspects of constructive comments and suggestions, the integration of all aspects of useful resources, with advanced management ideas and concepts, to guide our work practice, to further improve the overall level of service, to contribute to our common development! Strengthen customer communication, promotion of enterprise products, enterprises can establish a convenient channel for communication with customers. In order to better understand the customer's opinion, master the needs of customers, web site with a thin function, you can listen to the views of customers, understand the voice of customers, strengthen the relationship between the company and customers and establish a good customer relationship. 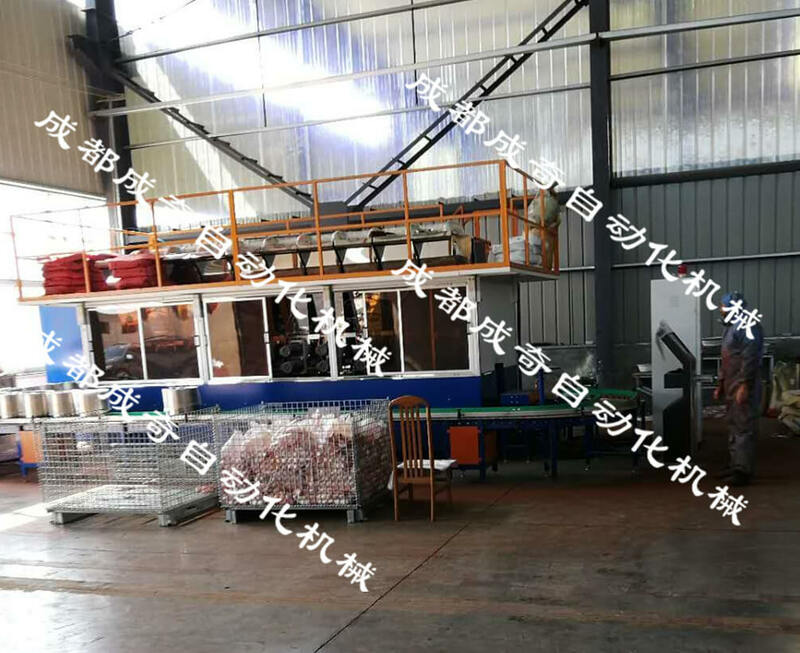 Automatic rubber batching system, rubber and plastic automatic batching equipment, rubber automatic batching machine, and automatic rubber weighing system. Automatic feeding system for mixer, automatic feeding system for internal mixer, automatic feeding system for internal mixer, automatic feeding system for internal mixer. 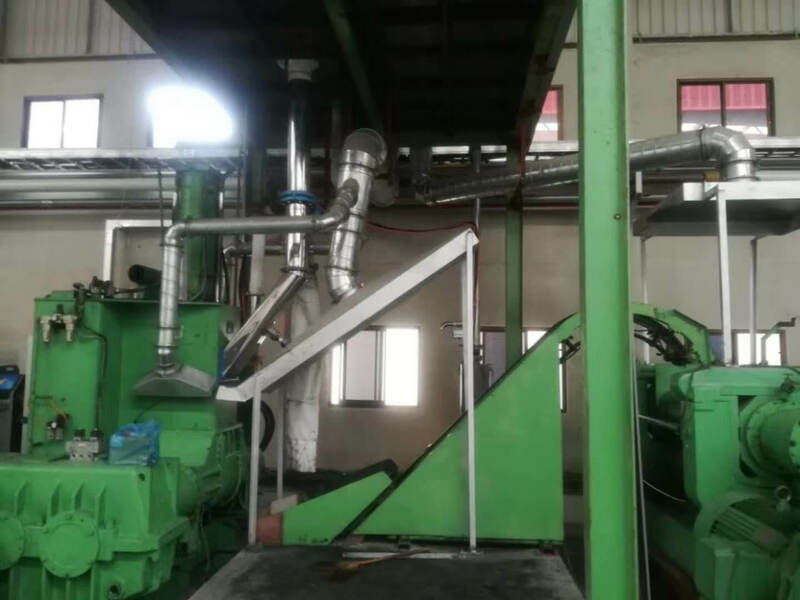 Equipment introduction: The automatic batching machine, which can save the formula, is a kind of high production efficiency, high precision and full automatic batching system, which is specially designed by our company for rubber and chemical industry. The system has the function of automatic weighing and distributing powder (carbon black etc. ), granular material (paraffin, etc. ), oil and other materials according to the required production formula. It can fit the 75~150L mixer, extruder, kneader and other equipment. 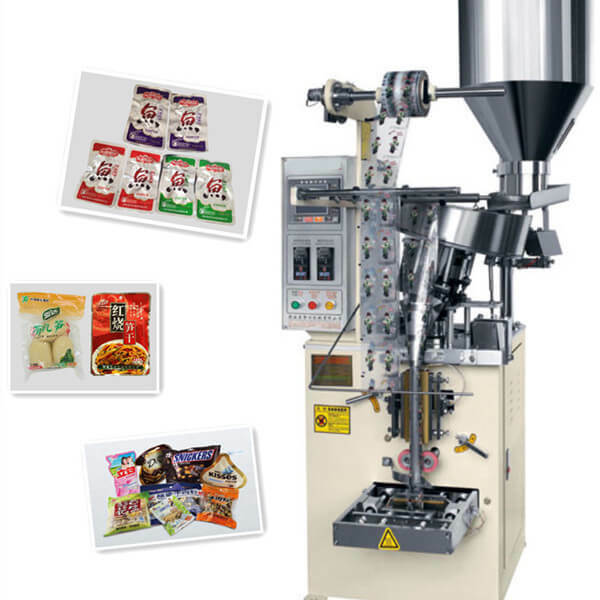 The automatic batching control process can save the formula of automatic batching machine. 1. reduce the opportunities for workers to contact with chemical raw materials, greatly reduce workers, reduce labor intensity, and improve workers' health protection. 2. avoid the influence of human factors on batching operations, ensure the stability of product quality and improve the quality and efficiency of products. 3. according to the properties of raw materials, according to the characteristics of raw materials, different feeding mechanisms and control algorithms are adopted to improve the proportioning efficiency and meet the requirements of production. 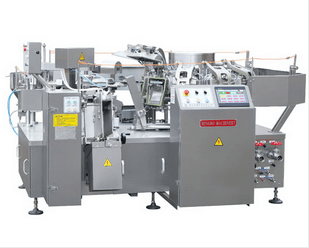 4. the automatic dispensing machine can be saved, and the feeder speed regulation technology can be used to meet the minimum dosage and accuracy requirements of raw materials. 5. control system, automatically save each weighing record and batch number of raw materials to achieve traceability of quality. 6. reliable controller and professional machining to ensure the stability of the system; abnormal alarm function ensures the reliability of batching. 7. easy to operate, just press the button to complete batch batching. Product advantages: It is mainly suitable for large and small batch formula production, intelligent storage production formula, call production formula at any time, store production data, etc., to help product quality traceability; Equipment performance: Ingredients: 6~50 material, suitable for various formulations. Single material distribution capability: 50g~200kg; Storage capacity: 1~20m3; Proportioning accuracy: + 1g, 2G, 5g, 10g, 20g; Batching speed: 5 to 30 minutes, one batch, 10 barrels per batch (barrel number can be set). According to the product raw material formula, the full automatic material proportioning system equipment is a kind of high production efficiency, high precision and full automatic dispensing system, which is specially designed by our company for multi raw material production, multi formula production industry (such as rubber, chemical industry, dyestuff and other industries). The system has the function of automatic weighing and distributing powder (carbon black etc. ), granular material (paraffin, etc. ), oil and other materials according to the required production formula. It can match the industrial production equipment of different specifications of 75~150L mixer, extruder and so on. Fully automatic micro batching scale is widely used in rubber, feed, food, pharmaceuticals, chemical industry, grain and other fields of industrial production, the powder, granular micro-raw materials for automatic batching weighing, automatic transmission. The equipment can continuously and accurately complete the following tasks for powder, granule, block and bulk materials in various industrial production environments: automatic weighing of trace materials, automatic quantitative batching, automatic conveying control. 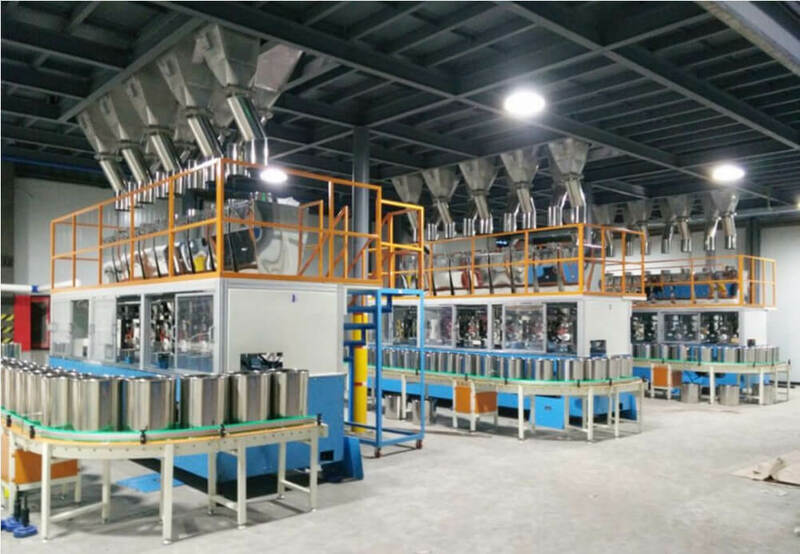 Its stable and reliable performance, intelligent and accurate, will greatly improve the efficiency of industrial production of micro-material batching system, while completely eliminating the artificial weighing of micro-material batching, feeding error rate may occur. Additive micro-component computer batching adding system can improve the accuracy and efficiency of feed additive micro-component batching weighing, completely overcome a variety of man-made operational errors, avoid a variety of feed additive batching weighing adding accidents, greatly reduce the economic losses caused by micro-component batching weighing. It can significantly improve the production efficiency of feed mills and realize the safety, high quality, cleanliness and high efficiency of feed additives in micro-component proportioning, weighing and adding. 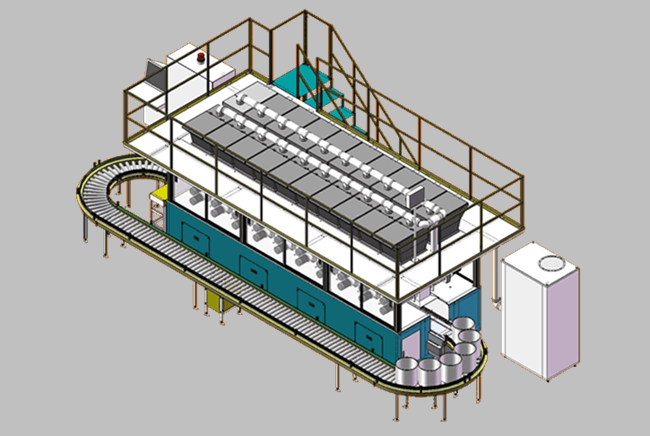 Equipment introduction: Mixer, kneading machine, extruder, and mixing machine small material automatic batching and weighing system, is a kind of high production efficiency, high precision and automatic production auxiliary system which is developed by our company specially for rubber and chemical industry. The system has the function of automatic weighing and distributing powder (carbon black etc. ), granular material (paraffin, etc. ), oil and other materials according to the required production formula, and can fit the 25~150L mixer with different specifications. Product advantages: It is mainly applied to the formulation of large and small materials, the formulation of intelligent storage, the production of recipes, and the production of data at any time, which helps to track the quality of products. Equipment performance: Ingredients: 8~20 material, suitable for various formulations. Single material distribution capability: 50g~200kg; Storage capacity: 1~20m fand; Proportioning accuracy: + 1g, 2G, 5g, 10g, 20g; Batching speed: 5 to 25 minutes, a batch, a batch of 10 barrels (barrels can be set up). Automatic batching control process: 1., reduce opportunities for workers to contact with chemical raw materials, greatly reduce workers, reduce labor intensity and improve workers' health protection. 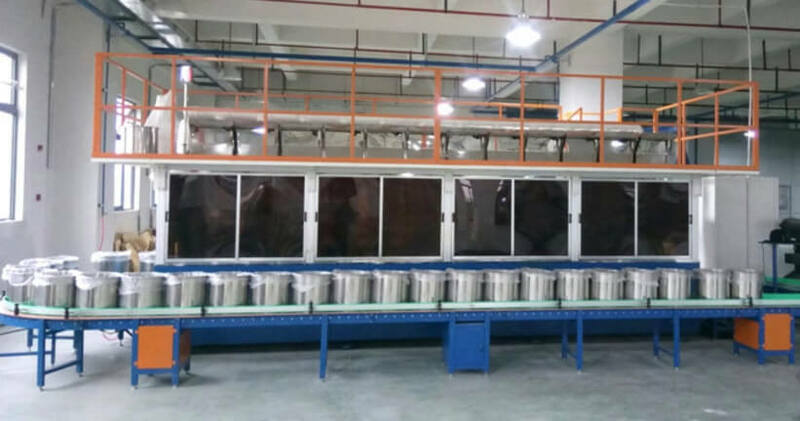 2., avoid the influence of human factors on batching operations, ensure the stability of product quality and improve the quality and efficiency of products. 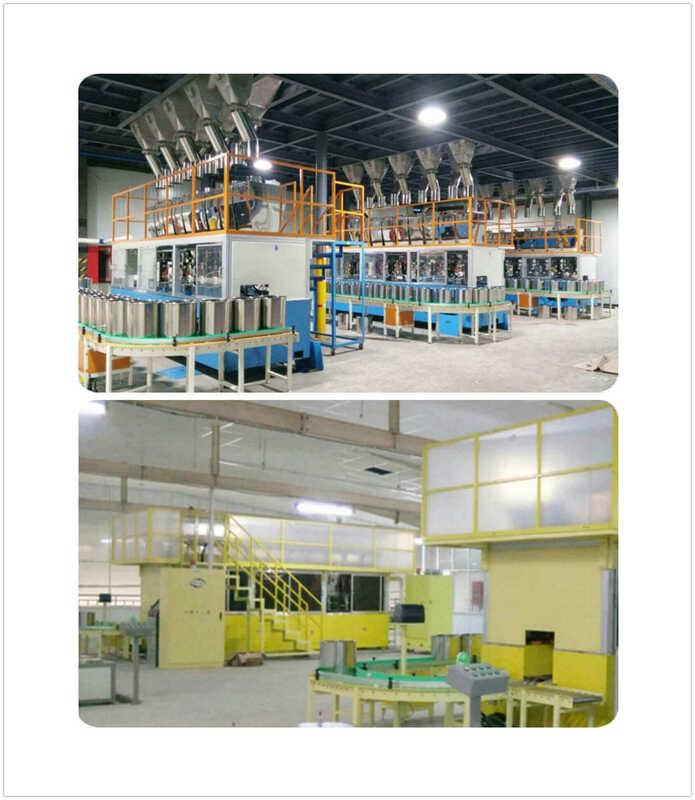 3., small batch automatic weighing and batching system. According to the characteristics of raw materials, different feeding mechanisms and control algorithms are applied to improve batching efficiency and meet production requirements. 4., the automatic batching system adopts feeder speed regulation technology to meet the minimum dosage and accuracy requirement of raw materials. 5., the control system automatically saves every weighing record and batch number to achieve quality traceability. 6., reliable performance controller and professional machining ensure the stability of the system. Abnormal alarm function ensures the reliability of batching. 7., it's easy to operate. Just press the button to finish batching. Equipment introduction: According to the product raw material formula, the full automatic material proportioning system equipment is a kind of high production efficiency, high precision and full automatic dispensing system, which is specially designed by our company for multi raw material production, multi formula production industry (such as rubber, chemical industry, dyestuff and other industries). 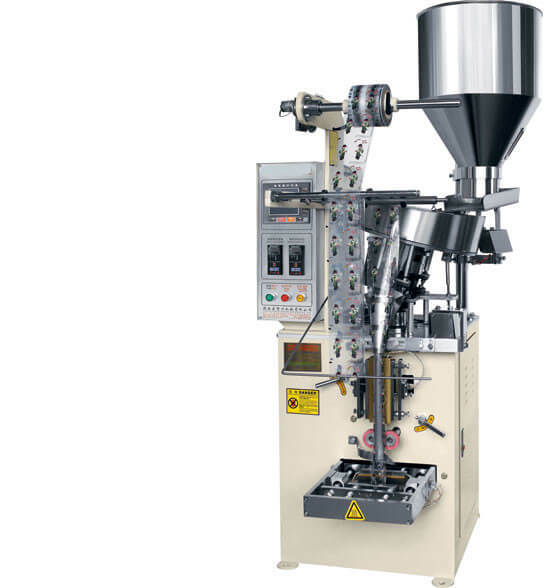 The system has the function of automatic weighing and distributing powder (carbon black etc. ), granular material (paraffin, etc. ), oil and other materials according to the required production formula. It can match the industrial production equipment of different specifications of 75~150L mixer, extruder and so on. Automatic batching control process: 1. reduce the opportunities for workers to contact with chemical raw materials, greatly reduce workers, reduce labor intensity, and improve workers' health protection. 2. avoid the influence of human factors on batching operations, ensure the stability of product quality and improve the quality and efficiency of products. 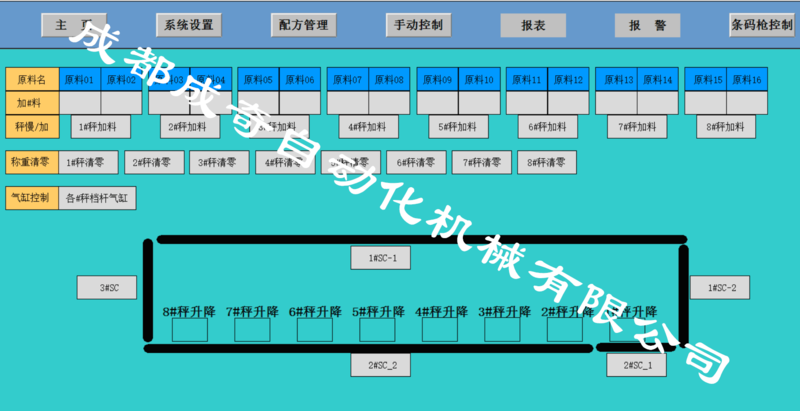 3. according to the raw material formula of the product, the system is fully automatic proportioning system equipment. According to the characteristics of the raw material, different feeding mechanism and control algorithm are adopted to improve the proportioning efficiency and meet the production requirements. 4. automatic batching system, using feeder speed regulation technology to meet the minimum amount of raw materials and accuracy requirements. 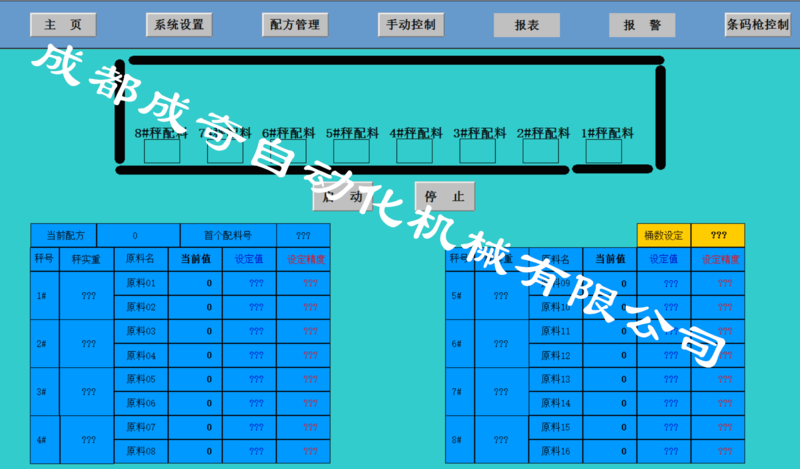 5. control system, automatically save each weighing record and batch number of raw materials to achieve traceability of quality. 6. reliable controller and professional machining to ensure the stability of the system; abnormal alarm function ensures the reliability of batching. 7. easy to operate, just press the button to complete batch batching. Product advantages: It is mainly suitable for large and small batch formula production, intelligent storage production formula, call production formula at any time, store production data, etc., to help product quality traceability; Equipment performance: Ingredients: 6~50 material, suitable for various formulations. Single material distribution capability: 50g~200kg; Storage capacity: 1~20m; Proportioning accuracy: + 1g, 2G, 5g, 10g, 20g; Batching speed: 5 to 30 minutes, one batch, 10 batches of a batch (barrel number can be set); Chengdu Chengqi Automation Machinery Co., Ltd.
Equipment introduction: The multi material of seasoning, condiment, seasoning bag, multi material automatic weighing and proportioning system, is a kind of high production efficiency, high precision and full automatic blending system which is developed by our company specially for food industry. The system has the function of automatic weighing and distributing powder (pepper surface), granule material (salt, chicken essence etc), oil material and other materials according to the required production formula. It can be applied to the production requirements of different specifications of 50~30000g. Product advantages: It is mainly applied to the formulation of large and small materials, the formulation of intelligent storage, the production of recipes, and the production of data at any time, which helps to track the quality of products. The food contact part is made of 304 stainless steel (full stainless steel case), which is compact and easy to maintain. The computer display screen is simple, easy to understand, easy to operate, and stable. Equipment performance: Ingredients: 6~14 material, suitable for various formulations. Single material distribution capability: 50g~200kg; Storage capacity: 1~20m fand; Proportioning accuracy: + 1g, 2G, 5g, 10g, 20g; Batching speed: 5 to 30 minutes, a batch, a batch of 10 barrels (barrels can be set up). Automatic batching control process: 1., reduce the contact opportunities between workers and raw materials, and ensure the hygiene requirements of food ingredients. 2., avoid the influence of human factors on batching operations, ensure the stability of product quality and improve the quality and efficiency of products. More than 3. materials, multi raw material automatic batching system, according to the characteristics of raw materials, using different feeding mechanism and control algorithm to improve the efficiency of the ingredients to meet the production requirements. 4., the automatic batching system adopts feeder speed regulation technology to meet the minimum dosage and accuracy requirement of raw materials. 5., the control system automatically saves every weighing record and batch number to achieve quality traceability. 6., reliable performance controller and professional machining ensure the stability of the system. Abnormal alarm function ensures the reliability of batching. 7., it's easy to operate. Just press the button to finish batching.